I won’t pretend that I’m an experienced homeschool mom who has “been there, done that”. There are some wonderful ladies who have decades of home education under their belts, and I sit in awe of their sage advice and experience. I’m a mama to only three blessings, only girls, and have only been in this parenting gig for 8 years and home educating for 3. I have not BEEN there. But I am here now. So I thought I would share what I do know, and what has been working for me so far in these short seasons. Maybe you are just starting out on your journey of teaching and discipling your children, or maybe you are thinking that you would like to homeschool but you just couldn’t because (insert myriad possible personal inadequacies here). Maybe you’re just starting out on your journey of teaching and discipling your children, or maybe you are thinking that you would like to homeschool but you just couldn’t because (insert myriad possible personal inadequacies here). This is how I survive and maintain my sanity as a homeschool mom. These habits help me to not only survive but remain sane and to even thrive depending on the particular season of parenting I’m in. Because surviving my children’s childhoods is not really the goal. 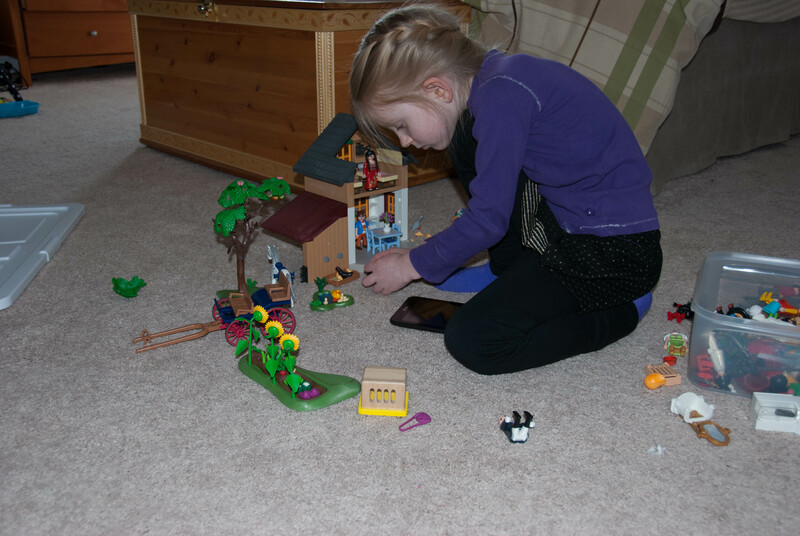 Playmobile is a popular quiet time toy. This is something I stumbled upon somewhat accidentally when my oldest gave up napping –which she incidentally did immediately preceding the birth of her younger sister. This younger sister is the one who screamed constantly when not being a) held, b) nursed, c) jostled or d) all of the above. She went months of sleeping in seldom more than 45 minute increments. So I trained Big Sister early on that a daily quiet time was non-negotiable. Every afternoon she was to spend an hour in her room, by herself, playing quietly. I supplied her with special toys which are not played with at other times. Toys that are not safe around babies. I reinforced this new habit with a small reward for a successful quiet time. No, I’m not above bribery! I think it can definitely be useful when establishing a new habit. Successful quiet time is defined as staying in your room, not calling mommy, and cleaning up when it is finished. She even resumed having naps (which she denied) for periods of time and would accidentally fall asleep while playing. It’s quite rare now that she’s 4 that Little Sister falls asleep during quiet time. Here she has fallen asleep listing to her stories. Little Sister stopped having regular naps at approximately the same age Big sister did (3 years) and she transitioned even more easily into the quiet time routine. She already knew this activity was expected as her sister had been having a regualar daily quiet time all along. Quiet time insures a break for mommy now, and children who grow up with the skill of being comfortable with their own company. Big Sister started learning to clean the bathroom at the age of 4. One of the biggest challenges for many homeschool moms is the struggle to maintain some semblance of organization, nutrition and cleanliness in a home that is being used heavily all day, every day. We may even be more challenged in this area than the working mom because at least the working mom’s children are out messing up a school or daycare during her working hours. A homeschooling home is a home that is fully lived in. The dishes, crumbs, and sticky fingers produced by three meals per day plus snacks. Toys strewn about. Books. More books. Bathrooms that receive heavy use by unskilled and rather short people. One of the most useful things you can do is to train your children from a young age that caring for the home is everyone’s responsibility. Start with your toddlers while they still think everything you do is fun! You might be surprised what they will be capable of by the time they are five years old if you start now. Good habits will also take you far. In our house, no one gets breakfast until they have dressed, made their beds, and put their dirty clothes away. Each activity or toy must be cleaned up before the next one (or meal) begins. Small messes are so much less intimidating than big ones! I really appreciated my previous efforts in training my girls when my youngest was born. 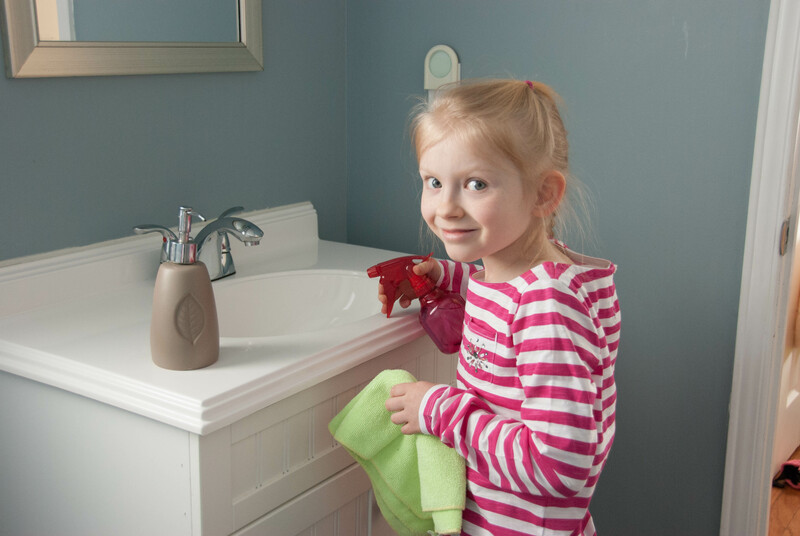 Even if I haven’t managed to get to my big cleaning jobs, my girls were able to empty the dishwasher each morning, clean the bathroom sinks, counters, and mirrors, keep their toys and bedrooms fairly neat, and ensure that the house was presentable. Did I mention that our house was put up for sale when I was one week post partum?! Yeah, that was fun. Children who participate in household chores make mama’s work easier, feel good about their contribution to the family and learn valuable life skills. I know there are some super organized moms who have a six week rotation of 30 different meals that they prepare for their families and have the pre printed grocery lists to go with it. They have inventory checklists taped to the door of their freezers so they know exactly what is in it at all times. I am most definitely not that woman. I can’t even think of 30 different meals, and there are only probably around 10 that I can make. I am not a big planner, nor am I a good cook. But I can almost guarantee you that if I wait until 4:15 every afternoon to try to figure out what to feed my family I am going to get stressed out. So feel free to take your meal planning as far as you would like, depending on your needs, personality and preferences. Like in everything else, I keep things simple and do the bare minimum: plan what will be eaten for dinner the next day at least the night before. Ideally, at the beginning of each week, I make a list of what we will have for dinner each night. 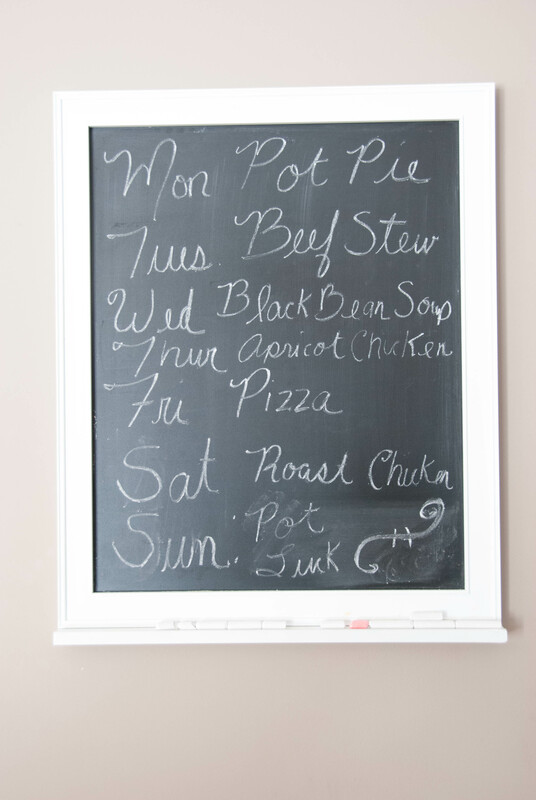 I have a chalkboard in the kitchen that I use for this purpose and by doing this I eliminate the stress of trying to decide at the last minute what to make. Combined with my minimalist meal planning, I have found two specific things to be of particular help: finding a few crockpot meals that my family loves, and doubling (or tripling) some of my regular meals for the freezer. For example, we almost always have crockpot meals on Tuesdays at our house because we are away from home all afternoon until 5:00, and then have to leave again at 6:00. So when we get home from our homeschool co-op and library visit, all we have to do is set the table and make rice, pasta or any other quick thing that we want to add on to the crockpot meal. Having even a loose plan for meals and food prep can significantly decrease your stress levels while ensuring your family doesn’t eat out of a can or box every night. Audio Books. Big Sister loves listening to Jim Weiss’ audiobooks which we have found at our local library and more recently for free to download with our library’s subscription to Freegal Music. We don’t have a membership but have heard awesome things about Audible as well. The girls have also enjoyed the audio version of The Jesus Storybook Bible and various other audiobooks on CD that our family owns or we have borrowed from the library. Adventures in Odyssey and Paws & Tales are also popular. Working Together is a great book that influenced my personal view of training children to work alongside you and find joy in working as a team. There are lots of ideas and inspiration on how to set up a system that will work for your family. Websites such as Plan to Eat. The Nourishing Home has tips on how to meal plan, wonderful, healthy recipes as well as a weekly meal plan for all three meals of the day. How do you stay sane while homeschooling? Can you share any tips on how you keep your homeschooling household running smoothly? Yes, yes, and YES to everything you just said!!! This is something that definitely needs to be addressed in our home. All.Of.It. Thanks for sharing and linking up to ‘Favorite Things Friday’ with Hip Homeschooling and Simply Rachel! Many of these things I’m needing to readdress regularly! Meal planning is my biggest struggle! Ha, train them young, YES! Love it! Some days I still feel like I’m losing my sanity, quiet time is essential! Thanks so much for linking up at Favorite things Friday! Yes! Love these tips. I am a huge advocate for meal planning. I need to work on the quiet time though. Great idea! Meal planning is the one I need to work on the most, and I notice a HUGE difference when I let it slip. Thanks for stopping by!